Simpsons Fish & Chips, Cheltenham has been crowned the best fish and chip shop in the UK at the ‘Oscars’ of the fish frying industry. 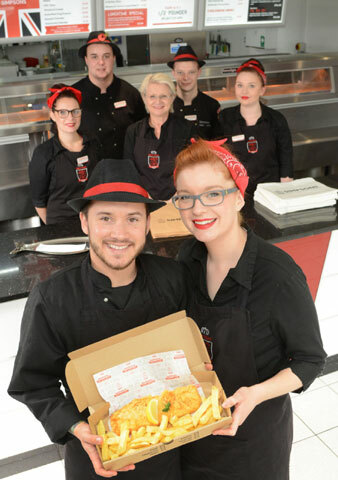 The shop scooped the ultimate title – Independent Take-away Fish and Chip Shop of the Year after beating stiff competition from nine other UK regional winners. Simpsons use a Hewigo High Efficiency range and the family have a long standing and successful association with Hewigo. 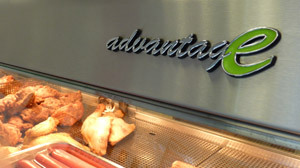 To further promote the energy saving qualities of its frying ranges, all Hewigo Advantage High Efficiency ranges now carry a special newly designed badge (see picture) with a distinctive green 'e' on the end of Advantage. The badge follows a well-recognised style particularly popular with car manufacturers and is prominently displayed in full view on the front of the range. "Hopefully it will become a talking point and show customers that the operator is using a highly efficient piece of equipment and taking environmental protection seriously," says UK General Manager Phillip Purkiss. Naturally the central component of the range is Hewigo's high efficiency burner which is Gastec rated to be 93% efficient. However the range may also incorporate other Hewigo energy saving components such as the 3-stage oil filtration, LED display lighting and computerised temperature and timer touch control. Phillip Purkiss adds, "As an industry we are often quick to promote, for example, that we use organically grown ingredients, source fish from replenishable stocks or offer gluten free options. Yet not so quick to demonstrate our energy saving credentials. This is one step in that direction. We calculate from actual customer experience that someone using our high efficiency equipment can save 30% on fuel consumption, 40% in oil usage and 20% in raw materials compared to a standard range. At a time of rapidly increasing costs these are savings worth having and worth shouting about." Hewigo have now found a way of getting bright illumination in its frying range display cabinets without overcooking the food and with lamps that are entirely food safe. 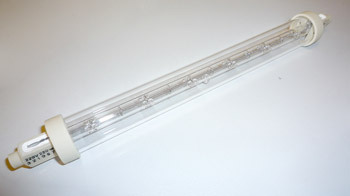 A display cabinet might normally have 3 x 300w ceramic heaters and 2 x 150w halogen lamps. In a standard frying range with three display cabinets that's a huge 3600w. 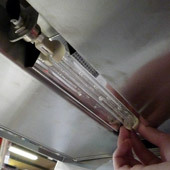 As well as the high consumption of electricity Hewigo were particularly concerned about using high pressure halogen lamps which are not food safe and decided to do something about it. The answer is a jacketed low pressure heat lamp which is totally food safe. Though these are readily available in 300w and 200w sizes, there is a problem. The 200w is too short and does not give good light coverage. The 300w is too powerful and if you turn down the heat the cabinet is not illuminated sufficiently. As a result Hewigo worked with a specialist German lamp manufacturer to develop a 220w jacketed heat lamp which is long enough to provide good illumination without burning the food and is entirely food safe. Another significant benefit is that the overall electricity used to illuminate and heat the cabinet is reduced by 45%. Following a trial period Hewigo have used these lamps in all their ranges manufactured recently with extremely positive reactions from customers. Phillip Purkiss, General Manager of Hewigo comments, "This is another development to make our ranges as user friendly and efficient as possible. These lamps are not generally available however in the interests of the industry as a whole we are happy to provide them to other range manufacturers should they wish to solve the same problem." 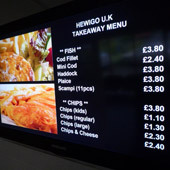 The ultimate in flexible menu presentation is now available through the new DPA System from Hewigo. The compact DPA System player can control four high definition TV's or monitors and the software allows you to create excellent menus and presentations quickly and easily. It's simple to add, change or remove price or product information and adapt your menus or shop promotions. Create your own template or use existing ones that are built into the system and your design can fit with your overall branding and internal shop design. The monitors can be used individually or together to create an overall effect and carry your own or broadcast media. The flexibility of the system means you can now promote your business in a dynamic and professional manner and that means greater turnover.